Download the iBooks app free from the App Store. More than a great ebook reader, it’s also an amazing place to browse and shop for books day or night. 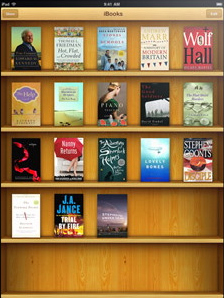 Tap the iBooks icon and your bookshelf appears. Tap the Store button and the bookshelf flips around like a secret passageway to reveal the iBookstore, where you can browse tens of thousands of books — many of them free. Browse by title, author, or genre. View what’s featured on the iBookstore, the New York Times best-seller lists, and more. Reading on iPad is just like reading a book. You hold your iPad like a book. You flip the pages like a book. And you do it all with your hands — just like a book. The high-resolution, LED-backlit screen displays each page beautifully. Turn iPad to the portrait orientation to view a single page. Or view two pages at once by rotating it to landscape. Move forward or backward by tapping the right or left side of the screen. Or turn a page slowly by dragging from right to left. Jump to a different section of the book entirely by visiting the table of contents and selecting a chapter. Touch and hold any word to look it up in the built-in dictionary or Wikipedia, or to search for it throughout the book and on the web. Even with all these extras, reading is so natural on iPad, the technology seems to disappear. • Double-tap an image within a book to view it in greater detail. • Experience books that include audio and video. • Enjoy substantial performance improvements when reading PDFs. • Look-up definitions to English words inside books without a specified language.